Offering you a complete choice of products which include dosing pumps for water treatment. Dosing Pumps are used to dose Swimming Pool chemicals into the Swimming Pool automatically. Fitted with a Chemical tank , the dosing pump ensures delivery of the chemical into the pool water directly without human intervention. 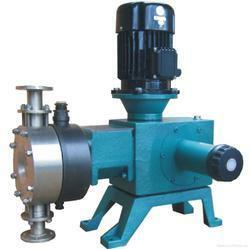 Dosing Pump procedures are also in vogue in textile and similar industries where chemical treatment is involved. In a power station treatment chemicals are injected or fed to boiler and also to feed and make up water under pressure, but in small dosages or rate of injection. The feeding at all places is done by means of small capacity dosing pumps specially designed for the duty demanded. Looking for Dosing Pumps for Water Treatment ?